Awoof! 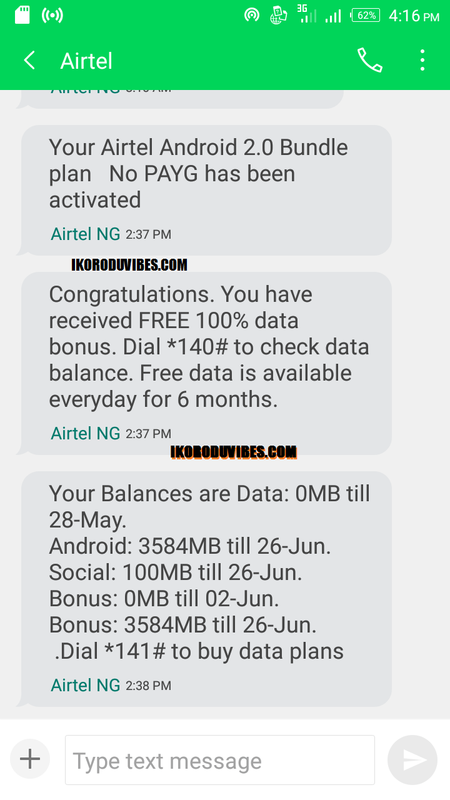 How To Double Your Airtel Data: Turn 3gb to 7gb, 5gb to 10gb, 10gb to 20gb, 24gb to 48gb | IkoroduVibes | Exporting Africa Entertainment..
Airtel Nigeria as we know is one the best network for data plans in Nigeria, now they are here again with the double data offer that will be lasting for months. If you are a heavy data user or you like downloading or surfing, and streaming videos on youtube using your smartphones or your computer, this offer is just right for you. Its an upgrade to the airtel default data plans whereby the data size has been doubled. 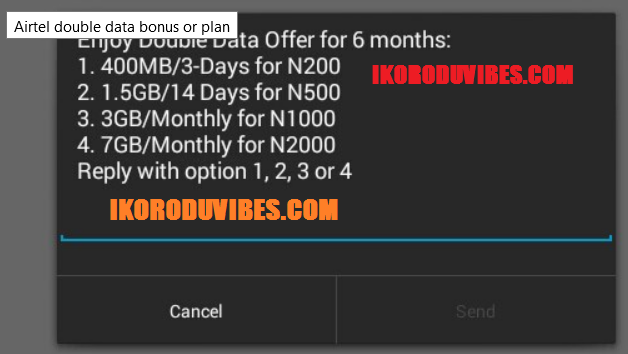 For instance, with 500 naira you can get 1.5GB of data which has a duration of one week, 1000 naira for 3GB instead of the usual 1.5GB for one month and many more which you will see the activation codes in this post, also the good thing about this offer is that you dont need to migrate to a special tariff plan to enjoy it. Note: This offer does not work on all sim card or subscribers, but you can check if it will work for you. With 2K or 2000 Naira one was entitled to get 3GB of data but with this promo or offer its Now 7GB plus bonus datas. To activate this offer, simply dial *144#, you will see the available options as shown in the screenshot below. After that select 1,2, or 3 depending on the one that correspond with the 7GB/Monthly for N2000. From the options you will select 4 for 7GB with N2000. Thats It! After your selection you will receive an sms confirming the activation as shown in the screenshot below. If you want to check the remaining data just dial *140# then you will receive a message containing the remaining data. With 1000 naira one was entitled to get 1.5GB of data but with this promo or offer its Now 3GB plus bonus data. To activate this offer, simply dial *144#, you will see the available options as seen in the screenshot. After that select 1,2, or 3 depending on the one that correspond with the 3GB/Monthly for N500. Voila! After your selection you will receive an sms confirming the activation. If you want to check the remaining data just dial *140# then you will receive a message containing the remaining data. With 500 naira one was entitle to get 750MB of data but with this promo or offer its Now 1.5GB plus bonus data. After that select 1,2, or 3 depending on the one that correspond with the 1.5GB/14-days for N1000. Just like in the ones above, you can use *140# to check data balance. With 200 Naira one was entitled to get 25MB of data but with this promo or offer its Now 500MB plus bonus datas. To activate this offer, simply dial *144#, you did above will see the available options as seen in the screenshot above. After that select 1,2, or 3 depending on the one that correspond with the 500MB/3-days for N200. To check the remaining data just dial *140# then you will receive a message containing the remaining data. Did it Work for You? You can respond using the comment section below. 0 Response to "Awoof! How To Double Your Airtel Data: Turn 3gb to 7gb, 5gb to 10gb, 10gb to 20gb, 24gb to 48gb"